Home » Blog » Pink or Blue: Maybe Not for You? Pink or Blue: Maybe Not for You? I’m about to embark on one of those special projects: designing the nursery for our first baby! As a designer, every once in awhile a certain project comes along that you get REALLY excited about. All projects are fun, but some are just really special. 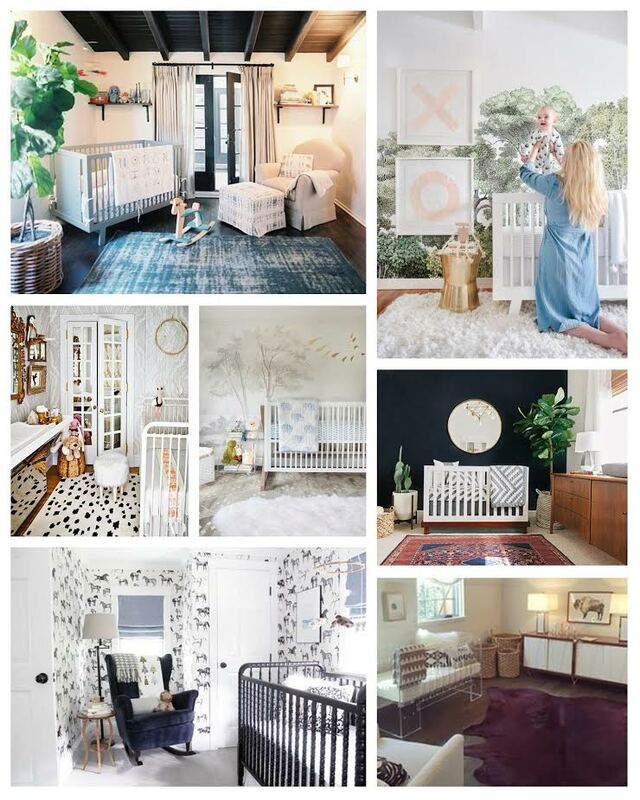 I’m about to embark on one of those special projects: designing the nursery for our first baby! Lots of surprises come with this new adventure in our lives, including the unavoidable stream of advice, suggestions, stories, and criticism. Who am I kidding? I’m not THAT surprised by this! Color…or lack thereof. I like neutrals, what can I say? I could have a hormonal spree in my third trimester and paint everything chartreuse, who knows, but I honestly think I’ll keep the general color scheme pretty neutral. However, that does NOT mean boring. Layering textures and using unique furniture styles can add a lot of interest to a space. Want to take it a step further? Add a pop of color! Check out the deep purple cowhide rug shown in one of the pictures below. Love, love, LOVE it! Not your typical glider. I totally get that comfort is key here, but I’ve never been the kind of girl to forgo style for comfort…except for the fact that I’ve worn leggings the past two weeks while this baby bump gets out of the awkward beginning phase. That’s a different story though! I love the idea of hunting down a great vintage chair and revamping it a little. A cool mid-century modern or tufted piece will add a whole lot of style to the room. Reupholstering it in a brand new fabric can make it feel nice and fresh, plus adding rocking chair legs will make it perfect for those late night rocking sessions. Who has room for JUST a changing table?? We live in cute little house built in 1951, that being said, our nursery is not huge. I’m definitely going to have to pick furniture pieces that are multi-functional. What’s the first thing to be marked as inessential? A changing table. My plan is to buy a dresser that will provide ample storage and just put a changing table pad on top. Voila! Two birds, one stone. Wallpaper! Wallpaper! Wallpaper! This is the fun part. As a designer I have an absolute love for wallpaper. We are constantly amping up clients’ spaces by using amazing wall coverings. There are some amazingly fun options shown in the images below. Some of my favorites are the watercolor trees, black and white horses, and grey-toned agate. If you thought that wallpaper was a luxury nursery addition that you might not be able to afford, think again. You can cut costs by just doing an accent wall or trimming out the bottom half of your walls (do yourself a favor, hop on over to Pinterest and search “board and batten trim”) and just wallpapering the top half of your walls. Now that you’ve decided that amazing wallpaper is going to be an integral part of your nursery décor, the hard part begins: picking from the hundreds of options! Let the indecision begin…..